When mayonnaise is to be used in sandwiches, only a short shelf life is needed. Enzyme stability is therefore not a significant consideration in the development of sandwich mayonnaise. Instead, the focus is on developing a spreadable, creamy texture – one which will not drip on application and will enhance the succulence of the sandwich filling. Traditionally real 80% oil mayonnaise was used in sandwiches, giving the end product a high fat content. However, in our more health conscious times, sandwich manufacturers want to convey a healthier image. Most are looking for a sandwich mayonnaise that imitates the texture of real mayonnaise, so it is spreadable like butter, but with as little oil as possible so it can be declared lower in fat. We can help you develop new sandwich mayonnaise products which meet all the requirements of your customers. Our focus is, of course, on helping you develop a product which tastes great. 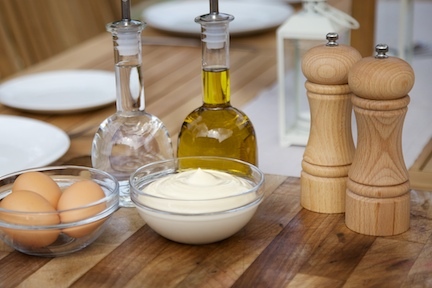 We can help you choose the correct oil content for the mayonnaise you are looking to make. Sandwich mayonnaise using 45% oil can be made with taste and textural characteristics that are very close to real mayonnaise of a much higher oil content. Spreadability can be achieved at 20% oil content together with good creaminess. By the addition of fibres and other clean label ingredients 12% oil contents can be achieved with good succulence and taste profile. Our team can also advise you on how to develop a clean label sandwich mayonnaise product. And our product development specialists can help you work out the best approach – whether the mayonnaise is to be used with bread-based sandwiches or tortilla wraps, or whether it will be used for standard or wet fillings. Contact us today to discuss the requirements for your new products. Viscosity and shear damage issues can both arise in the production of sandwich mayonnaise. We can help you avoid these risks, as well as eliminating other potential problems which can damage the end product. These include rehydration issues leading to emulsification instability caused when excess amounts of thickener are used to enhance the stiffness of the mayonnaise. Overnight enzyme instability can also cause the bread to become soggy – but again, we have the know how to ensure this won’t happen to your product. Contact us to discuss how we can help with any issues you are experiencing with your products. KaTech can help you reduce the cost of producing sandwich mayonnaise, while always ensuring product quality is maintained. Very low oil contents need less egg emulsifier to be used so cost optimisation can become a challenge at this end of the spectrum. The aim here is to produce a product which has enhanced properties for the same cost or examine production methods and techniques to give you an advantage which can be extolled during the sales process. Let us help you reduce your recipe costs by contacting us today.